"SS St. Louis" redirects here. For other uses, see List of ships named SS St. Louis. 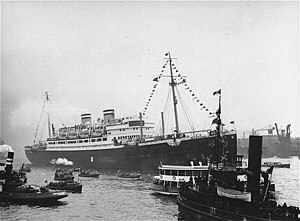 MS St. Louis was a German ocean liner known for carrying more than 900 Jewish refugees from Germany in 1939. Originally intending to debark in Cuba, they were denied permission to land. The captain, Gustav Schröder, went to the United States and Canada, trying to find a nation to take them in, but both refused. He finally returned the ship to Europe, where various European countries, including Belgium, the Netherlands, the UK, and France, accepted some refugees. Many were later caught in Nazi roundups of Jews in occupied countries, and historians have estimated that approximately a quarter of them died in death camps during World War II. These events, known as the "Voyage of the Damned" in one account, have inspired film, opera, and fiction. MS St. Louis surrounded by smaller vessels in its homeport of Hamburg. St. Louis was a diesel-powered ship (as opposed to a steamship) and properly referred to with the prefix MS or MV, built by the Bremer Vulkan shipyards in Bremen for HAPAG, better known in English as the Hamburg America Line. She is often known as SS St. Louis. The ship was named after the city of St. Louis, Missouri. (Her sister ship, MS Milwaukee, was also a diesel motor ship/motor vessel owned by the Hamburg America Line). St. Louis regularly sailed the trans-Atlantic route from Hamburg to Halifax, Nova Scotia, and New York City, and made cruises to the Canary Islands, Madeira, Spain; and Morocco. St. Louis was built for both transatlantic liner service and for leisure cruises. St. Louis set sail from Hamburg to Cuba on May 13, 1939. The vessel under command of Captain Gustav Schröder was carrying 937 passengers, most of them Jewish refugees seeking asylum from Nazi persecution of Jews in Germany. Captain Schröder was a German  who went to great lengths to ensure dignified treatment for his passengers. Food served included items subject to rationing in Germany, and childcare was available while parents dined. Dances and concerts were put on, and on Friday evenings, religious services were held in the dining room. A bust of Hitler was covered by a tablecloth. Swimming lessons took place in the pool. Lothar Molton, a boy traveling with his parents, said that the passengers thought of it as "a vacation cruise to freedom". Bound for Cuba, the ship dropped anchor at 04:00 on May 27 at the far end of the Havana Harbor but was denied entry to the usual docking areas. The Cuban government, headed by President Federico Laredo Brú, refused to accept the foreign refugees. Although passengers had purchased legal travel visas, they could not enter Cuba either as tourists (as laws related to tourist visas had recently been changed) or as refugees seeking political asylum. On May 5, 1939, four months before World War II began, Havana abandoned its former pragmatic immigration policy and instead issued Decree 937, which "[clarification needed] restricted entry of all foreigners except U.S. citizens requiring a bond of $500 and authorization by the Cuban secretaries of state and labor. Permits and visas issued before May 5 were invalidated retrospectively. None of the passengers knew that the Cuban government had invalidated their landing permits. Telephone records show American officials Cordell Hull, Secretary of State and Henry Morgenthau, Secretary of the Treasury had made some efforts to persuade Cuba to accept the refugees. Neither they nor the American Jewish Joint Distribution Committee, which pleaded with the government, were successful. With his passengers prohibited from landing in Cuba, Captain Schröder directed St. Louis and the remaining 907 refugees towards the United States. He circled off the coast of Florida, hoping for permission from authorities to enter the United States. Cordell Hull, Secretary of State, advised Roosevelt not to accept the Jews. Captain Schröder considered running aground along the coast to allow the refugees to escape but, acting on Cordell Hull's instructions, US Coast Guard vessels shadowed the ship and prevented such action. After St. Louis was turned away from the United States, a group of academics and clergy in Canada tried to persuade Canada's Prime Minister, William Lyon Mackenzie King, to provide sanctuary to the passengers. The ship could reach Halifax, Nova Scotia in two days. A Canadian immigration official Frederick Blair, hostile to Jewish immigration, persuaded the prime minister on June 9 not to intervene. In 2000, Blair's nephew apologized to the Jewish people for his uncle's action. As Captain Schröder negotiated and schemed to find passengers a haven, conditions on the ship declined. At one point he made plans to wreck the ship on the British coast to force the government to take in the passengers as refugees. He refused to return the ship to Germany until all the passengers had been given entry to some other country. US officials worked with Britain and European nations to find refuge for the Jews in Europe. The ship returned to Europe, docking at the Port of Antwerp (Belgium) on June 17, 1939, with the 907 passengers. The British Prime Minister Neville Chamberlain agreed to take 288 (32 per cent) of the passengers, who disembarked and traveled to the UK via other steamers. After much negotiation by Schröder, the remaining 619 passengers were also allowed to disembark at Antwerp. 224 (25 per cent) were accepted by France, 214 (23.59 per cent) by Belgium, and 181 (20 per cent) by the Netherlands. The ship returned to Hamburg without any passengers. The following year, after the Battle of France and the Nazi occupations of Belgium, France and the Netherlands in May 1940, all the Jews in those countries were subject to high risk, including the recent refugees. St. Louis Captain Gustav Schröder negotiates landing permits for the passengers with Belgian officials in the Port of Antwerp. Of the 620 St. Louis passengers who returned to continental Europe, we determined that eighty-seven were able to emigrate before Germany invaded western Europe on May 10, 1940. Two hundred fifty-four passengers in Belgium, France, and the Netherlands after that date died during the Holocaust. Most of these people were murdered in the killing centers of Auschwitz and Sobibór; the rest died in internment camps, in hiding or attempting to evade the Nazis. Three hundred sixty-five of the 620 passengers who returned to continental Europe survived the war. Of the 288 passengers sent to Britain, the vast majority were alive at war's end. After the war, the Federal Republic of Germany awarded Captain Gustav Schröder the Order of Merit. In 1993, Schröder was posthumously named as one of the Righteous among the Nations at the Yad Vashem Holocaust Memorial in Israel. A display at the United States Holocaust Memorial Museum in Washington, DC tells the story of the voyage of the MS St. Louis. The Hamburg Museum features a display and a video about St. Louis in its exhibits about the history of shipping in the city. In 2009, a special exhibit at the Maritime Museum of the Atlantic in Halifax, Nova Scotia, entitled Ship of Fate, explored the Canadian connection to the tragic voyage. The display is now a traveling exhibit in Canada. In 2011 a memorial monument called the Wheel of Conscience, was produced by the Canadian Jewish Congress, designed by Daniel Libeskind with graphic design by David Berman and Trevor Johnston. The memorial is a polished stainless steel wheel. Symbolizing the policies that turned away more than 900 Jewish refugees, the wheel incorporates four inter-meshing gears, each showing a word to represent factors of exclusion: antisemitism, xenophobia, racism, and hatred. The back of the memorial is inscribed with the passenger list. It was first exhibited in 2011 at the Canadian Museum of Immigration at Pier 21, Canada's national immigration museum in Halifax. After a display period, the sculpture was shipped to its fabricators, Soheil Mosun Limited, in Toronto for repair and refurbishment. In 2012, the United States Department of State formally apologized in a ceremony attended by Deputy Secretary Bill Burns and 14 survivors of the incident. The survivors presented a proclamation of gratitude to various European countries for accepting some of the ship's passengers. A signed copy of Senate Resolution 111, recognizing June 6, 2009 as the 70th anniversary of the incident, was delivered to the Department of State Archives. In January 2017, software engineer Russel Neiss and Rabbi Charlie Schwartz set up a kind of internet memorial, a Twitter account that posted the name of each passenger who was killed after being refused entry to the US. The format of each tweet included the passenger's name, the sentence "The US turned me away at the border in 1939", and the location where each was killed. In May 2018, Prime Minister Justin Trudeau announced the Government of Canada would offer a formal apology in the country's House of Commons for its role in the fate of the ship's passengers. The apology was issued on November 7. MS St. Louis was adapted as a German naval accommodation ship from 1940 to 1944. She was heavily damaged by the Allied bombings at Kiel on August 30, 1944. The ship was repaired and used as a hotel ship in Hamburg in 1946. She was later sold and was scrapped in 1952. Julian Barnes's novel A History of the World in 10½ Chapters (1989) recounts the trials of the MS St. Louis Jews in the chapter "Three Simple Stories"
Leonardo Padura's novel Herejes (2013) centers around the St. Louis incident. SS Patria, sunk by a Haganah bomb on 25 November 1940 in the Port of Haifa. SS Navemar, designed for 28 passengers, in 1941 the vessel carried 1,120 Jewish refugees to New York. MV Struma, a schooner chartered to carry Jewish refugees that was torpedoed and sunk by a Soviet submarine on 5 February 1942. MV Mefküre, a schooner carrying Jewish refugees that was torpedoed and sunk by a Soviet submarine on 5 August 1944. Komagata Maru, a merchant ship carrying Asian migrants that was denied entry to Canada in 1914. ^ Madokoro, Laura. "Remembering the Voyage of the St. Louis". Active History. ^ a b "United States Holocaust Memorial Museum completes ten-year search to uncover the fates of St. Louis passengers" (Press release). United States Holocaust Memorial Museum. October 6, 2006. Archived from the original on June 26, 2007. Retrieved July 17, 2007. ^ a b "The Righteous Among The Nations: Gustav Schroeder". Yad Vashem. Retrieved January 29, 2017. ^ a b c d Rosen, Robert (July 17, 2006). Saving the Jews (Speech). Carter Center (Atlanta, Georgia). Retrieved July 17, 2007. ^ "The Voyage of the St. Louis" (PDF). American Jewish Joint Distribution Committee. June 15, 1939. Retrieved January 29, 2017. ^ "What was the Coast Guard's role in the SS St. Louis affair, often referred to as "The Voyage of the Damned"?". United States Coast Guard History. December 21, 2016. Retrieved January 29, 2017. ^ "Maritime Museum Exhibit on Tragic Voyage of MS St. Louis". Government of Nova Scotia. November 5, 2010. Retrieved September 12, 2014. ^ "Clergy apologize for turning away the St. Louis". CBC News. Retrieved May 8, 2008. ^ Rosen, pp. 103, 567. ^ "The Tragedy of the S.S. St. Louis". Retrieved July 17, 2007. ^ Thomas and Morgan-Witts. Voyage of the Damned. ^ Scott Miller and Sarah Ogilvie (2010). Refuge Denied: The St. Louis Passengers and the Holocaust. University of Wisconsin Press. pp. 174–75. ^ Studio Daniel Libeskind, daniel-libeskind.com, 19 January 2011; retrieved 21 January 2011. ^ Taplin, Jennifer (January 21, 2011). "Perpetual Memorial of Regret". Metro News Halifax. Archived from the original on March 10, 2016. Retrieved March 22, 2017. ^ "Exhibitions", Canadian Museum of Immigration at Pier 21, pier21.ca; accessed 12 September 2014. ^ a b Eppinger, Kamerel. "State Department apologizes to Jewish refugees". shfwire.com. Retrieved September 26, 2017. ^ Daley, Jason. "Haunting Twitter Account Shares the Fates of the Refugees of the St. Louis". smithsonianmag.com. Retrieved September 26, 2017. ^ "Trudeau to offer formal apology in Commons for fate of Jewish refugee ship MS St. Louis". Retrieved May 11, 2018. ^ "Trudeau apologizes for Canada's 1939 refusal of Jewish refugee ship". Retrieved November 7, 2018. ^ "Billy Joel über die Enteignung seiner jüdischen Familie, Bühnentriumphe und gescheiterte Ehen ("Billy Joel on the expropriation of his Jewish family, stage triumph and failed marriages")". stern.de. Retrieved June 5, 2018. Levine, Robert M. (1993). Tropical Diaspora: The Jewish Experience in Cuba. Gainesville: University Press of Florida. p. 103. ISBN 9781558765214. Miller, Scott; Sarah A. Ogilvie (2006). Refuge Denied: The St. Louis Passengers and the Holocaust. Madison: University of Wisconsin Press. ISBN 978-0-299-21980-2. OCLC 64592065. Rosen, Robert (2006). Saving the Jews: Franklin D. Roosevelt and the Holocaust. New York: Thunder's Mouth Press. ISBN 978-1-56025-778-3. OCLC 64664326. Whitaker, Reginald (1991). Canadian Immigration Policy. Ottawa: Canadian Historical Association. ISBN 0-88798-120-8. Morgan-Witts, Max; Gordon Thomas (1994). Voyage of the Damned (2nd, revised (first in 1974) ed.). Stillwater, Minnesota: Motorbooks International. ISBN 978-0-87938-909-3. OCLC 31373409. Ogilvie, Sarah; Scott Miller. Refuge Denied: The St. Louis Passengers and the Holocaust, Madison, WI: University of Wisconsin Press, 2006. Wikimedia Commons has media related to St. Louis (ship, 1929).